We continue the chronicle of the 35th Division in World War II with the advantage of 50 years of retrospect with access now to facts about which we could only speculate when the events happened back in 1945. The Battle of the Ardennes was declared officially over on January 28, 1945 with the Germans under steady pressure slowly withdrawing toward the Rhine River, Masters always of skillful delaying actions. Hitler had pulled the entire German Sixth Panzer Army out of the Ardennes and had sent them across Germany to bolster his eastern front against the Russians. This left huge gaps in his defensive lines along the western front which had to be closed as the remaining units had to spread out in thinner lines leaving the German defenses disastrously weak and short of reserves, both infantry and armor. The allies returned to their Rhineland campaign which had been interrupted by von Runstedt’s unsuccessful offensive. The 35th Division, after its brief sojourn with the Seventh U.S. Army in the Vosge Mountains was once again in the front lines North of the Ardennes, this time about seven miles inside of the German border with The Netherlands, along the West edge of the Wurm River and along the flooded Roer River, and about 12 miles North of the Town of Julich. The 35th Division scouts in vicinity of Heinsberg, Germany. German outposts, snipers’ nests, and artillery observers were scattered in the level plains in front of us, protected by numerous hidden mine fields and booby traps. February’s unseasonal warming thaw was making the ground into soggy and muddy fields. In the skies above aerial flights daily passed overhead toward the East and back, targeting industrial areas and strategic targets with their lethal loads, and occasionally Luftwaffe planes passed reconnoitering and sometimes strafing. More frequent were the German “buzz” bombs which “put-putted” overhead in erratic patterns, sometimes cutting their motors and plunging to earth with huge explosions. With the moderation of the weather came encouraging reports from the eastern front of the steady progress of the powerful Russian armies ever closer to the German borders. From the “other war” halfway around the world came news from the Philippines and McArthur’s relentless island hopping campaign bringing the war ever closer to the Japanese Islands. The feeling of victory was in the air and the G.I.’s sensed it. The Allied plan in Europe for February, 1945 was for a general offensive all along the front, from Nijmegen in the North to the Saar area in the South, to drive the Germans back across the Rhine River. The main effort was to be in the North and we were right in the center of this sector. It would be made by Field Marshall Montgomery’s 21st Army group, consisting of the 1st Canadian Army on the left, with several British units attached, and the U.S. Ninth Army on the right. The 35th Division was in the Ninth Army, with the XVI Corps , on the left of Ninth Army’s front. Gen. Anderson was the Corps Commander and we were with the 9th Armored Division, backed by the 79th Division and for a short while also the British 7th Armored Division. Gen. Simpson’s Ninth Army had a total of 11 U.S. Divisions, 303,243 men and over 2,000 tanks spread about 50 miles along the Roer River from Venlo South to Krauthausen which is some 20 miles West of Cologne. 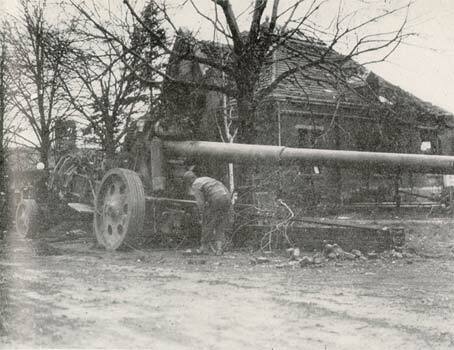 Captured German Gun near Borth, Germany. In Operation Veritable the Canadians were to jump off on February 6, 1945, attacking South and southeasterly along the West side of the Rhine River to link up with the northward attacking Americans who were to attack two days later, and put huge pincers around the German Roer River defenders. The Canadians hope for a quick armored breakthrough which, however, never materialized and the attack turned into a slow slugging match with a stubborn, reinforced German defense. The American attack had to be postponed when the Germans opened the sluices to the Roer River dams including the huge Schwammenual Dam, raising the level of the Roer River by four feet, a current of 10 miles per hour and widened the river from a narrow 90 feet to 300 yards and in some places 1½ miles. It wasn’t until February 23rd that we could move. During those two extra weeks, Ninth Army built up further supplies, units were built up to full strength, 46,000 tons of ammunition were amassed and 3 million gallons of gasoline so our tanks would not run short as they had done at Nancy. Our troops had additional training in river crossing techniques, mine and booby traps, attack of concrete fortifications such as were in the Siegfried Line just across the Roer River. Unit commanders also were on flights in light observation planes to observe and study the areas over which we were soon to attack. Replacements and men returning from the hospitals brought us up to full strength and we were allowed to give passes to our men to visit nearby Brussels. We were ready! In addition to our XVI Corps, other American Division in Ninth Army included the 2nd, 3rd and 5th Armored Divisions, and the 8th, 29th, 30th, 83rd, 95th, 99th, and 104th Infantry Divisions. Intelligence reported that we outnumbered German defenders perhaps 5 to 1, that German units were way under-strength, that there were too few German soldiers to defend the entire West wall fortifications and that we would likely experience heavy defense centered around the many villages and towns. To each division in our sector a tank battalion armed with Sherman tanks and 75mm guns was attached. They were manned by colored troops in some instances and led by white officers. We received the 784th Tank Battalion which soon proved itself as an effective, courageous, and dependable unit which earned the respect and admiration of the infantrymen who worked together well with the tankers. On February 23, 1945, a day before the flooding had fully subsided, over 2,000 guns opened up a terrific barrage across Ninth Army front, beginning at 0245 hours, with one gun for every two yards of front. Forty-five minutes later our 320th Infantry jumped off along with five other divisions. Our Santa Fe men crossed the Wurm River and swept the Germans before them closing on the Roer River. The other divisions all crossed the Roer River in massive attacks. The 134th Infantry sent patrols into Hilfarth while part of the division feinted a river crossing at another location to confuse the Germans. On February 25th, the 134th attacked and took Hilfarth along with a small bridge across the Roer River, still usable. The 137th Infantry crossed the Roer on the right and took Doveren and attacked northeast. The 320th Infantry crossed the Roer using a bridge in the 84th Division sector to our right. Shortly the 35th Division was cutting through the Siegfried Line and extending its bridgehead, taking 23 German towns in two days. With the 84th Division on our right, only Germans were on our exposed left flank. Straight North ran the Siegfried Line with its fortifications for some 20 miles. Somewhere beyond was the Canadian Army attacking South. To the North were at least four German Divisions, including the 183rd Volksgrenadiers, Elm’s 338th, the 176th Division and parts of the First Parachute Army, some of these along the Roer River facing West. The Santa Fe Division was poised for a breakthrough reminiscent of St. Lo. Twenty-three miles North of us were The Netherlands and the Dutch city of Venlo, on the East bank of the Roer River. Gen. Paul Baade grhtmed the situation and the opportunity. On February 28th, he created Tank Force Byrne, named after the commander of the 320th Infantry, and including that regiment, two field artillery battalions, the 216th and 275th, the 784th Tank Battalion, and companies from the 654th Tank Destroyer Battalion, the 60th Engineers and the 110th Medics. The tank force moved North behind the German lines with Dough boys riding the tanks, engineers blowing up pillboxes along the way. Baade asked and received permission from Gen. Anderson to cross into the British sector and on March 2nd we took Venlo with some sharp fighting in town. Once again, as in the Third Army blitz across France, the Sante Fe men were cheered by a local population as the weary but deliriously happy Dutch people by the thousands poured out into the streets of Venlo, many dressed in orange, to greet their liberators after more than four years of Nazi occupation. 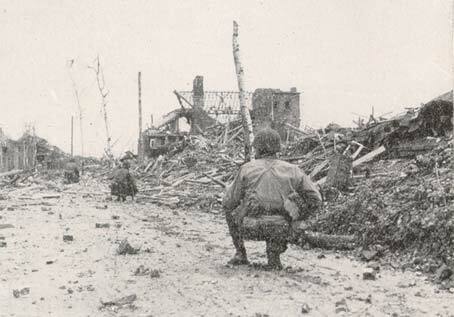 The 35th Reconnaissance Troop took Herkenbosch and Roermond, and a battalion of the 134th Infantry continued North and on the next day, against sharp opposition, took the Town of Geldern, 13 miles to the North, and made contact with the British forces moving in from the North. Meanwhile, Task Force Byrne wheeled northeastwardly and with full power charged off toward Wesel on the Rhine, some 30 miles away, shooting up the country side, setting fires to haystacks and some houses and battling groups of Germans along the way, fighting from village to village. Straelen was taken, also Sevelen, and a score of other smaller villages. 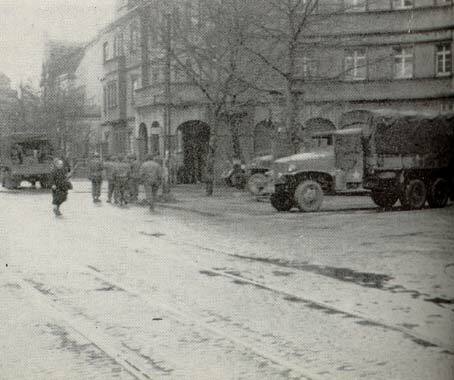 The 137th Infantry also operating as a Task Force “Murray” moved on the right, coordinating with a task force from the 8th Armored Division, and took Lintfort and then Rheinberg in some of the sharpest fighting, advancing through an area they called “88" alley. The Germans were now throwing all of their ammunition at the Americans as they retreated into a 5 by 8 mile pocket defending the approaches to the two Rhine River bridges which crossed into Wesel. The 35th Division drive determined to cut off this last pocket of enemy resistance West of the Rhine River, hoping to seize the remaining bridges. Canadians were pinching in from the south and southeast. Bitter opposition slowed Tank Force Byrne which still took Huck and Drupt and were relieved by the 134th Infantry moving through Kamp and Drupt and taking Borth, Buderich and finally Fort Blucher to find that the Jerries had blown the bridges before they could get there. The British 52nd Division relieved the 35th men on March 11th and Operation Grenade was over. We were at the Rhine, looking across at the Ruhr Valley, the Pittsburgh of Germany, some 8,000 square miles of factories and iron and steel producing areas. In our sixteen days of engagement, we had taken 4,775 prisoners, suffered lighter casualties than expected. In fact, Ninth Army had taken only 7,437 battle casualties, of which 1,048 were KIA’s. Another 5,546 were lost from non battle causes. The entire 9th Army had taken 29,628 prisoners, and an unknown number of casualties and deaths were inflicted on the Germans. On March 8, 1995, the 9th Armored Division in the First Army had captured the Remagen Bridge South of Cologne over the Rhine River.